[From top left] 1. To start, the vinyl is vacuumed to get rid of as many bubbles as possible, 2. The vinyl is then poured directly into mold, filling up to the top of the joints, 3. The mould is submerged in cooking chemicals for a certain amount of time depending on the vinyl thickness required, 4. Excess is poured out and the mold is cooked again, 5. The mold is submerged into cold water to cool down, 6 and 7. The mold is mounted on a base and the casting is cut and pulled free, 8. In some cases a centre spinning machine is employed earlier on in the casting process to again reduce bubbles, 9. Mold storage at the factory! 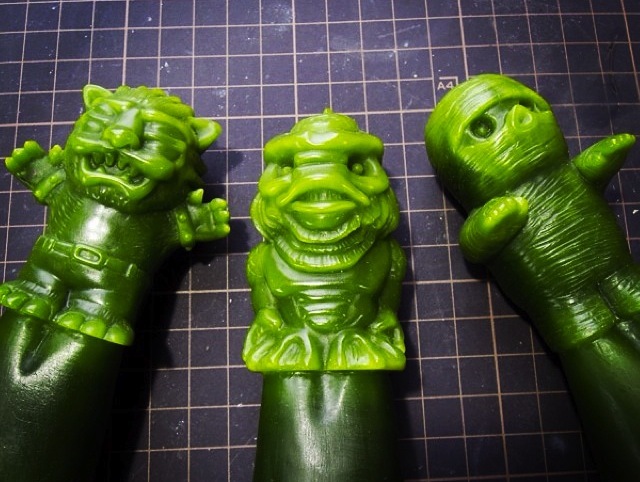 Revealed right here in test-shot form last month, we are very proud to finally be able to share The Disarticulators‘ Oozeball sofubi in it’s initial “OG Ooze-It Green” colorway! 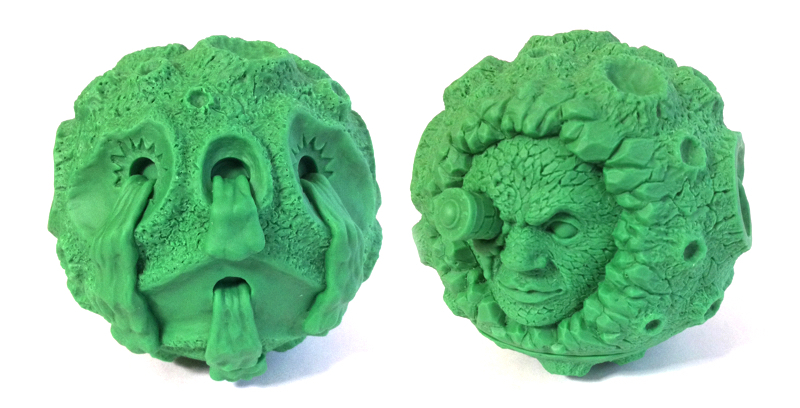 Here’s the blurb for the figure… “A follow-up to last years hugely popular keshi-ball release, the DA’s Tru:Tek has completely redesigned the figure from the ground up for the new medium, opting for a more organic, Ooze-It like face, paper clay-style textures and the pièce de résistance… a hidden face inspired by Georges Méliès iconic 1902 silent movie, Le Voyage dans la Lune! Beautifully sculpted by none other than Zectron, the 2-part design has been upscaled from the original 2″ diameter to little over 3″- making it both more in-keeping with the classic Madball scale, and, more interestingly, compatible with a wide variety of mid-sized kaiju with the capped base removed…” With the first batch of green balls making their way over from Japan to the UK in the next week or so, those savvy enough to jump in on the preorder back in November will be receiving their orders very soon… And to those that didn’t? Well you’ll be glad to know that a small reservation has been put to one side for a release in the Man-E-Toys store over the coming weeks. But that’s not all! Rampage Toys will be unveiling the first ever painted version of the ball at Wonderfestival Winter 2015 this weekend- be sure to stay tuned for a full reveal plus release details tomorrow! 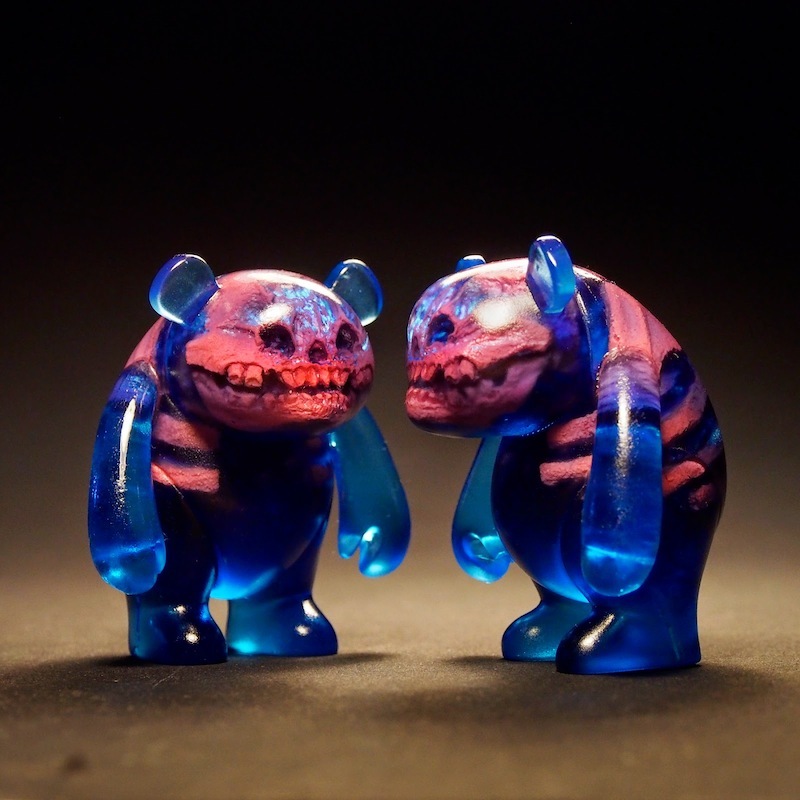 After months of hard work and organisation, Gary Boon over at Blue Frog World is finally ready to reveal his first ever original resin creation… the Bohna Skully! 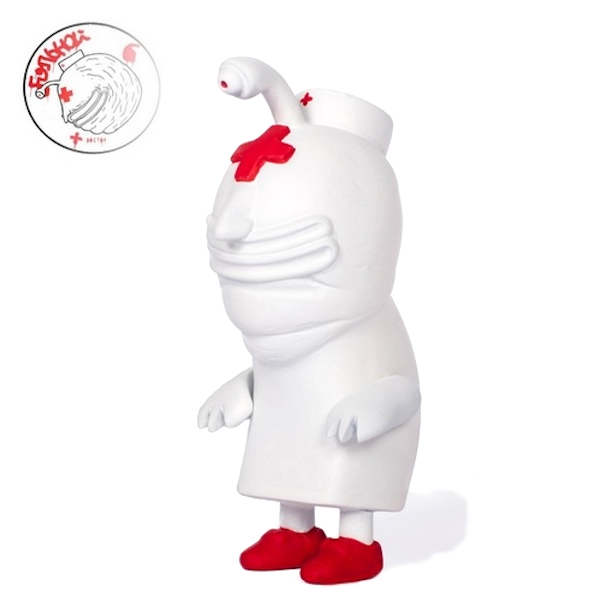 Initially starting out as a sketch and quickly progressing to digital form via 3Ds Max, the sleek 2-part design has been created primarily as a platform for customisation, drawing inspiration from the likes of Ferg’s “Sqube” and MAD’s MADL to form a subtly interesting yet neutral enough canvas for artists to work with. 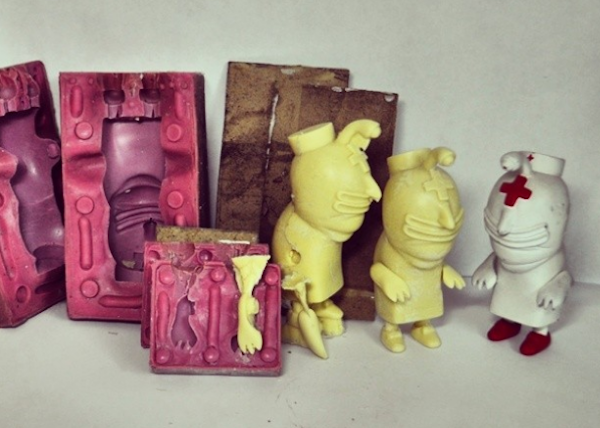 Produced by our very own Tru:Tek over at the Disart ToyLabs, an initial run of 25 blank DIY versions have been created for a custom show to be held at ToyCon ’15. 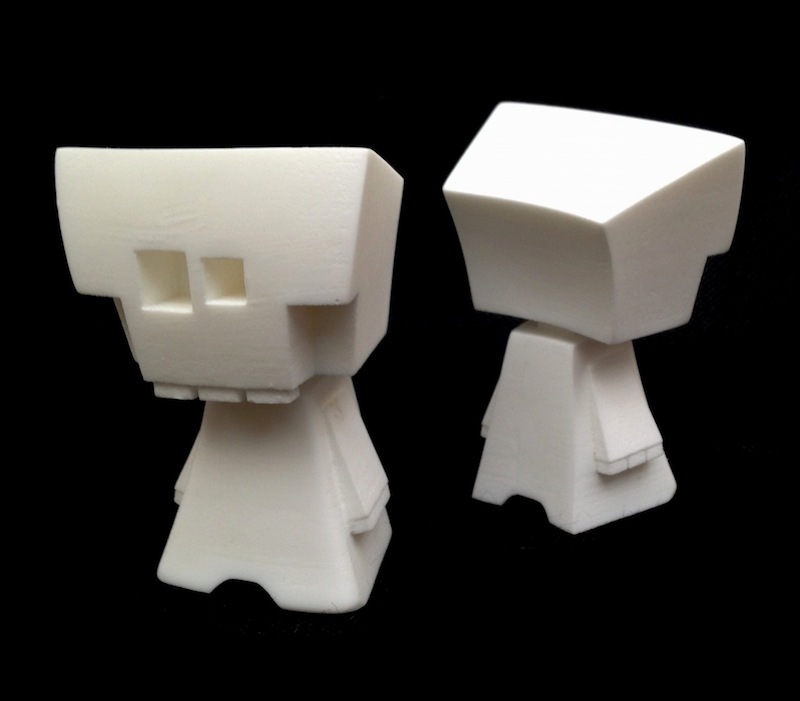 With most currently winging their way to the hugely talented list of people below, Gary will also be giving one lucky up and coming artist the chance of bagging the figure early and having their own creations displayed at the event too. A Little Stranger, Ardabus Rubber, Blue-Frog, Lunabee, Matt Jones, Mr Lister, Okkle, One Eyed Girl, PlanetDomu, Roar with Lukas,RunDMB, Toy Terror, Uncle Absinthe, UME, WuzOne.